Exit this area and use Charizard to fly back to Malie City. Heal up if you'd like, then head north into Malie Garden. 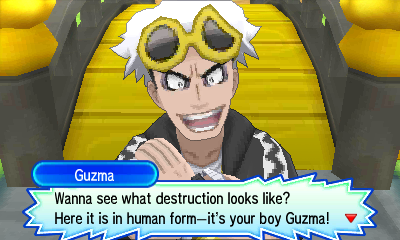 Here you'll have to battle Team Skull Boss Guzma. He has a Lv. 34 Golisopod and a Lv. 34 Masquerain. 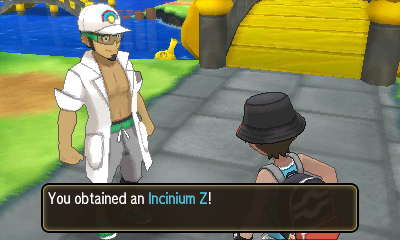 After winning the battle, Professor Kukui will reward you with the Z-Crystal for the starter Pokémon you chose. A brief cutscene with Lillie and Acerola will play. Heal up and head south from Malie City onto Route 11. 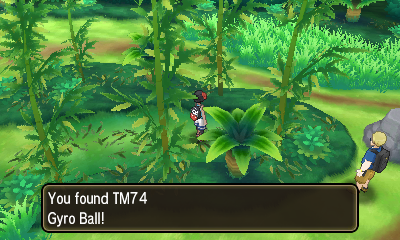 Along the top route, you'll find a double battle and along the middle route you'll find TM74 - Gyro Ball. 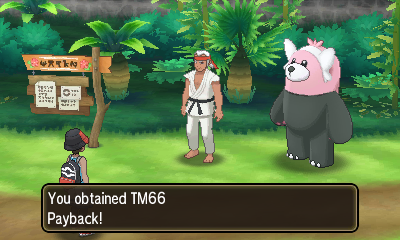 There's two more trainers to battle afterward, the latter of which will give you TM66 - Payback for winning. There's another trainer battle and a few item balls containing a Quick Ball and 2 Big Mushrooms. Continue east onto Route 12. 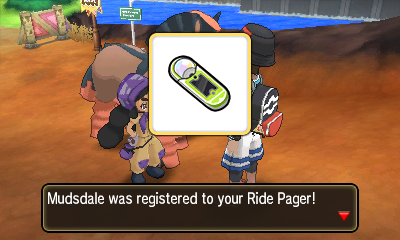 Hapu will meet you here adn register Mudsdale to your Ride Pager. 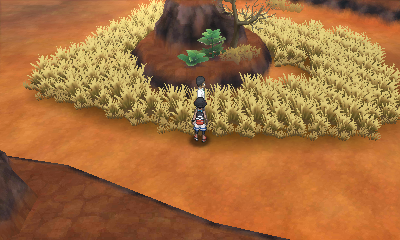 You'll need to use Mudsdale to cross the rocks here. Pick up the Burn Heal and continue south. The right path has two trainers and a Hyper Potion, the left path has one trainer and will also yield an Elixir. There's two more trainers in the southern area of this route. Continue southwest over the rocks onto Route 13. 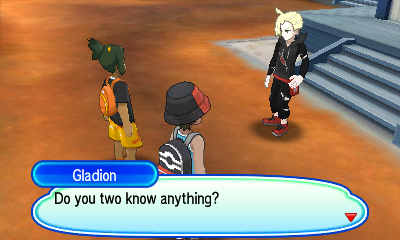 When you arrive on the route, a cutscene with Hau and Gladion will play and you'll get a Max Potion. 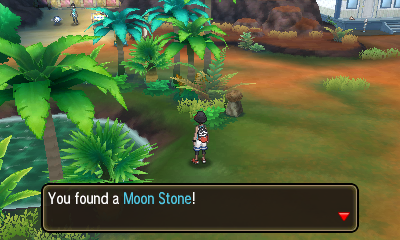 In this area you can also find a Moon Stone next to the oasis and a Guard Spec. to the south. Afterward, continue left into Tapu Village. 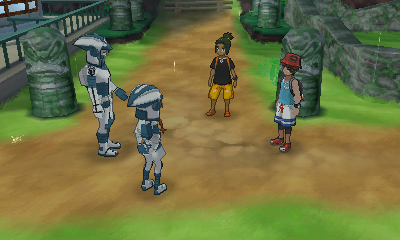 Continue into the village to once again meet up with Hau. Zossie and Dulse will also pay you a visit. Heal up if you need to, then head left onto Route 15. Head north and enter the Aether House. 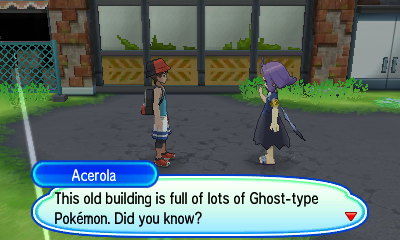 After battling a preschooler inside, Acerola will invite you to take on her trial. Exit the house. 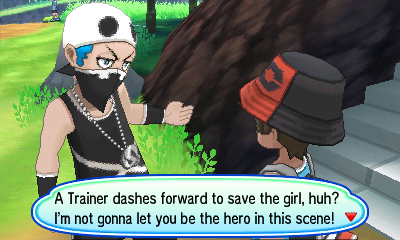 Once outside, you'll have to rescue Lillie by defeating a Team Skull grunt in battle. Afterward, Lillie will give you 5 Luxury Balls. Head south back into Tapu Village. Heal up, then head south from here onto Route 14. 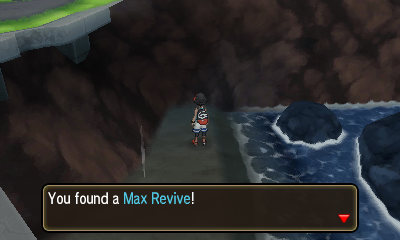 If you explore this short route you'll find two trainers to battle as well as a Max Revive and Max Potion. When you're ready, head through the gate and a cutscene will play. Enter the abandoned Thrifty Megamart and the Trial of Acerola will begin! 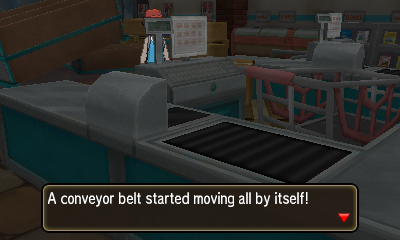 Head towards the back of the building and you'll see a conveyor belt start to move on its own. Use the Poké Finder and take a picture of the Gastly. You'll then need to defeat it in battle. Continue forward and a shopping cart will begin to rattle. 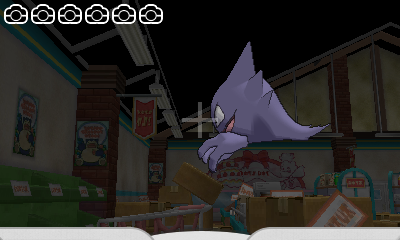 Examine it and snap a photo of the Haunter. Defeat it in battle as well. Head to the back of the room and you'll see some levitating dolls. Examine them and snap a photo of Gengar, once again defeating it in battle. At the back of the room, you'll find Acerola. Tell her that you aren't leaving each time that she asks. Then take a photo and she'll dissapear. When you enter the little room, turn around and take a picture of the totem Pokémon. Your battle will be with a Lv. 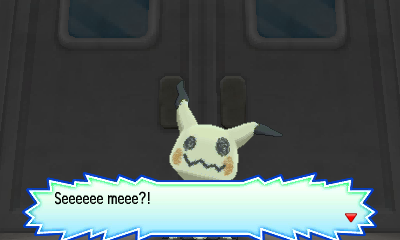 35 Totem Mimikyu. Make sure not to use a Z move right off the bat, as Mimikyu's disguise will absorb your first hit. Make sure to target the totem first and you'll eventually win the battle. Afterward, you'll be rewarded with Ghostium Z and 10 Dusk Balls. 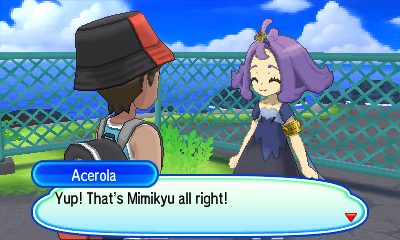 The Trial of Acerola is complete!